A Free Vocal Exercise that will make you smile! from Barbara Lewis! A Free Vocal Exercise That Will Make You Smile! Here´s a free vocal exercise that´s easy on the voice for the earliest part of your warm-up. THE MAGIC OF A GREAT WARM UP! We singers, so eager to get to our gorgeous songs, often miss the the pleasure and the potential for real vocal discovery in the daily warm up. It is here that you set the tone for your vocal day. It´s here that you find the calm co-ordination that makes high notes easily accessible. You start in your easy low range and move up into your easy middle range. No straining. No tightening. At this point in your warm up, you are just asking those vocal cords to gently vibrate - with the added benefit of a nice buzzing quality in your face (teeth, gums, nasal area...). Some days, your voice will feel wonderful - some days you may wonder if you will ever get a note out that sounds right. This is how it goes. As you become a better singer, you will discover ways to coax your voice into shape. Sometimes, during a warm up, if I am feeling a bit ¨blah,¨ I take a few minutes to switch mental gears. I may do some reading about singing or perhaps I´ll listen to another singer whose work I admire. It´s a wonderful mystery how much we can gain from watching other singers do something well. Sometimes I find that I come back to my own singing in a totally different state of mind, and I sing much better! The trick is to listen to someone else´s art without feeling that your own ability is in any way diminished. You are finding inspiration for your own improvement.... So listen as an artist. 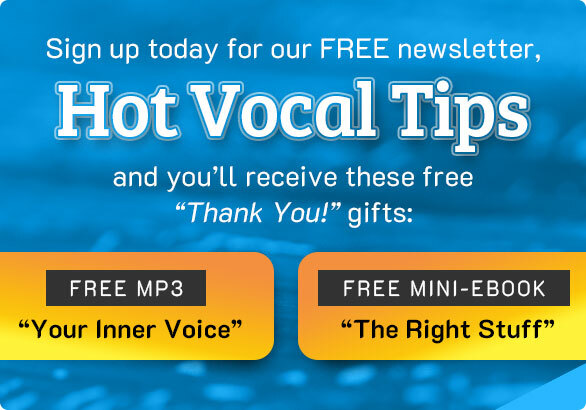 If you do not receive the HOT VOCAL TIPS FOR SMART SINGERS NEWSLETTER, but you would like to, please Subscribe Now! 1. A one-of-a-kind GIFT - a Guided Meditation (MP3) called, ¨Your Inner Voice.¨ This guided meditation is a rejuvenating blend of uplifting words, original music and real ocean waves, (from the seashores of Cancun, Mexico) – created to bring you closer to your own true, rich voice. 9 Valuable Tips To Give Your Singing A Boost! Occasionally, and only through this newsletter, you will be sent other powerful guided meditations. Don´t miss this opportunity to get on the ¨FREE¨mailing list! I will never share or sell your e-mail addresses.